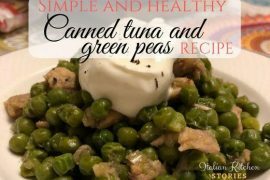 So, today recipe is delicious and easy to prepare….let’s dig in. 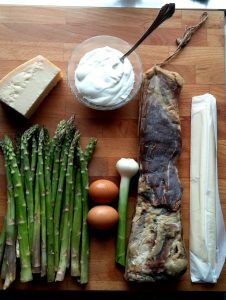 Wash the asparagus, chop the dry bottom and then depending on their length cut them on 2-3 pieces (I have left the tip part a bit longer to decorate the cake). 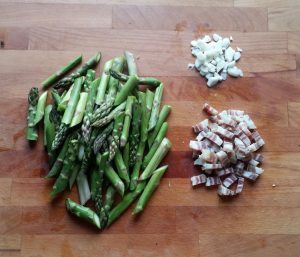 Chop the garlic and bacon. 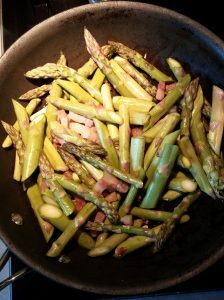 Saute the garlic and bacon over a olive oil over the low heat until the bacon becomes glassy transparent (not brown) and then add asparagus, leaving the tip parts. Saute all for about 3 min and then add the tips as well. Add salt and pepper and continue for another 2-3 min. 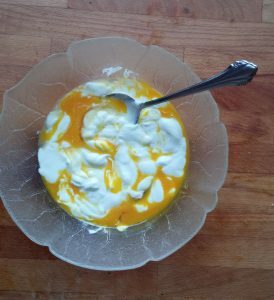 Mix the eggs with Greek yogurt and grated Parmesan cheese until you get the nice smooth texture. Add a bit of salt and pepper into the mixture (don’t exagerate as cheese and bacon are already salty quite a bit). Turn your oven on 200 C before moving to step 4. 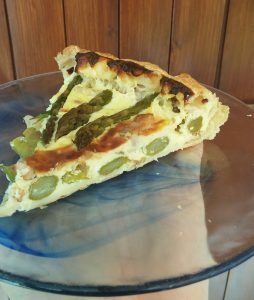 Lay the pastry into the baking form (I like to use the round one but you can use other shapes as well) and add only the stalks of asparagus, cover them with yogurt mix. 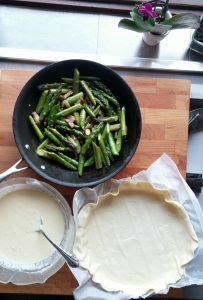 Once asparagus stalks are covered start adding tips and bacon. I usually start like marking the circle like the watch 12, 3, 6 and 9 and then fill in the gaps. Close down the pastry folding it and twisting it a bit with your fingers following one direction. 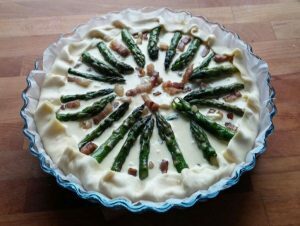 Place it in your oven and bake for 25-30 minutes. Once it’s fully baked take it out and cool it for a 10 min before cutting it. 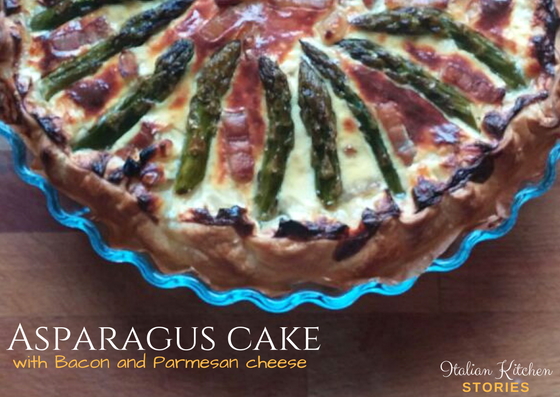 You can serve the asparagus cake as a warm starter or as a min meal with a salad on a side. 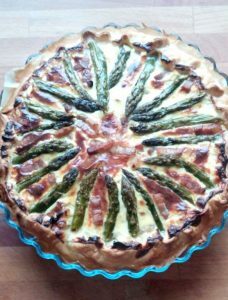 If you tried and loved this asparagus cake recipe, leave me a note….and if you have tweaked it let me know what did you use.